Marketing is often more an art, than a science. At the same time, it is a quite complex business area, which accumulates dozens of concepts and tools. In this post, we gathered ideas on how you can illustrate frequently used marketing concepts. Company reviews presentations often contain a section about planned and achieved marketing results. You can use plain numbers in tables to show these results or you can do better. Illustrate those data and concepts in a more interesting visual way. To bring these concept ideas to life, a good idea is to apply icons and diagrams in the presentation. Some of our favorites are below. Check icon ideas from flat icons collection – suitable for style-neutral graphics fitting to any presentation style or get informal and go for a creative hand drawn symbols. Such a style is more personal and unique. The very first word that pops into mind is content. Every day marketers struggling to deliver relevant and valuable content to their audiences and this war is won by those who can do it in the fastest and most efficient way. general content: communication symbols, such as message, letter and smartphone with a message, search or discovery, laptop, document, input and washing machine, commerce icons, e.g. a suitcase or a box, speech bubble. or be more specific: media data, writing pen and book, present, magnifying glass. Find particular examples of presenting content in this blog article. How often do we hear the word ‘deadline‘? All the time, right? We have to set specific deadlines because if there’s no time limit, there’s no real work. Besides using obvious deadline associations like the hourglass, stopwatch and man with ticking time, we propose going more creative way: choose skull with crossed bones, the dead man leg or a poison – to represent the final termination, finish line banner to show that your team has reached the planned result. Grab more inspiration and take a look at the blog: Ideas to show deadline in any document. One of the main requirements to the contemporary marketing activities and to marketers themselves – to be innovative and unique. The struggle comes with deciding how to best graphically represent innovation and novelty in your presentations. You may use icons of drones and rockets, beakers, satellites and wind turbines as well as the general ‘new idea’ icons like light bulbs and stars The scribbled light bulb, novelty stars or a chemist figure designs are perfect for presenting fresh ideas or new projects. Further ideas on illustrating innovation and novelty – click to open another blog post. If you want to show that the company is dynamic or your solution is adaptable, then for sure you need to remember about this concept. We’d suggest representing the idea of something adaptable or flexible by a simple pictogram: equaliser buttons to represent changing settings, strategy symbol showing a planned transformation, recycling arrows pictogram illustrating a change, process icon for showing dynamics, universal puzzle blocks for various setups and flexible assembly, renewable energy symbol representing an innovation, or evolution into new technologies, cycle symbols to show a change process. Here’s article with more specific inspirations on presenting Flexibility within your slides. Marketing is all about promoting products or services. There are two cases you can experience: the first one is when you already have a real product, then it’s easy. In case you are presenting a new product, doing a kind of product launch, it can be harder. In both cases, we have a proper solution. Here are a few ideas how you can represent a generalized product or service on your presentation slides: an opened box, shopping cart and basket, a tablet and a smartphone, household goods or home appliance. 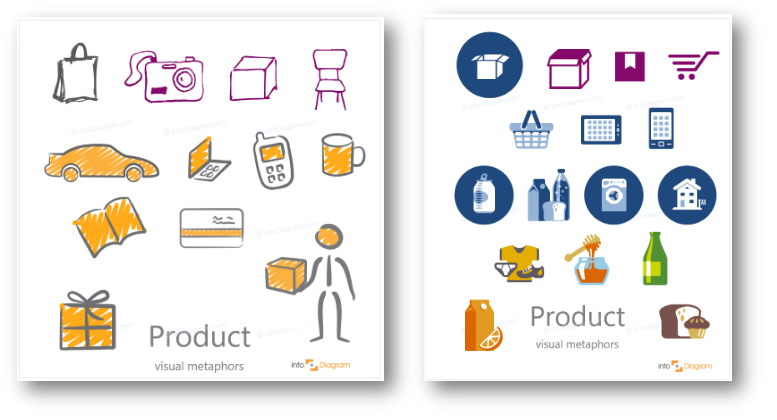 Find more examples and icons for illustrating product concept here. Those were a few ideas on how our you can picture those core marketing concepts: content, deadline, innovation, flexibility and product. Use one graphical style over your presentation, unless you have a specific reason to use more (e.g. to underline some part). But also, in this case, stick to 2 styles at most. Use a limited set of colors (your company colors palette) and fonts. Adapt colors of the icons to your branding style, to create the unified graphical look. If the icons are vector ones, you can do it easily in PowerPoint. Check if icons and other elements are aligned. Don’t stuck too much text and icons into one slide. Need to show another concept in a presentation, besides marketing? Action, Structure, Strategy Growth? We’re sharing visualization ideas for other business concepts too. All mentioned icons are designed by infoDiagram team and available from our infodiagram.com website. Miss other concept or marketing idea? Leave us a comment.